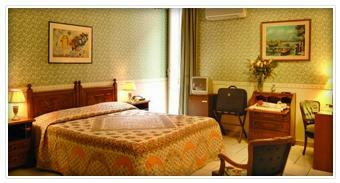 Hotel Borbone, Naples. Borbone Hotel Naples. Thanks to a long tradition from 1962, Hotel Prati is a unique structure for its situation and comforts, which is located at a few metres from the Historic Centre of Naples, as well as close to its Commercial and Financial centre. This strategic situation makes our hotel the perfect place, where you can stay both for your business or pleasure trips. Perfect in order to satisfy the needs of the most demanding clientele, the structure can welcome those who love the cuisine, thanks to the Masaniello restaurant, where our chef prepares unique dishes of the most traditional cuisine of Naples. You will be welcome in comfortable rooms, provided with every amenity and modern technology like cable radio, for your relaxing moments, satellite TV, private bathroom completed with shower and direct telephone line. Confide on our staff at your disposal, in order to help you during your permanence and give you all the useful information. The small-sized animals are admitted. We want to remember you that the structure can partially welcome disabled people.